Approach the water with caution. Be aware that ocean conditions can change. This is the safest level of nearshore conditions. Be cautious and maintain alert for choppy seas, currents, and breaking waves. Users of kayaks and other unpowered craft must be aware of strong wind, wave, and current conditions that can carry you offshore, and are capable of changing unexpectedly. SURF ALONG NORTH FACING SHORES WILL BE 1 TO 3 FEET TONIGHT, RISING TO 6 TO 8 FEET FRIDAY. Adjacent to the Hotel Haleiwa, but hid away behind a grove of Pride of India trees, fragrant at the time of our visit from the delicate odor of its profuse lilac flowers, is the old Emerson mission homestead, now being demolished, showing quaint features in its structure of pioneer days. Near the old house is the never-failing spring, Kawaipuolo, of legendary fame, which furnishes water to the hotel. Not far from this point, but across the Anahulu stream, stand the ruins of Waialua’s Female Seminary, prominent in this line of missionary work under the Gulicks and the late Mary Green, and the original “Haleiwa” of this place, which name the hotel has appropriately adopted. After the first American Protestant missionaries arrived in 1820, they began establishing stations in the rural areas of O’ahu. The first of these was the Waialua Station, opened in July 1832 by John S. Emerson and his wife. They lived on the bank of Anahulu Stream where Emerson continued his missionary work until 1864, when he retired because of ill health. He died at his home in 1867. On August 5, 1899 the name Hale’iwa was re-introduced when the Hale’iwa Hotel opened near the mouth of Anahulu Stream. Built as a resort on the O.R. & L. train line, its first manager was Curtis P. Iaukea, who had served as royal chamberlain to King Kalakaua at ‘Iolani Palace. During the height of its popularity, the hotel made the name Hale’iwa famous, and when its doors closed in 1943, the name Hale’iwa remained as the name of the surrounding community. Hale’iwa Beach Park was dedicated in October 1939 as Waialua Beach Park, but the community requested that the name be changed to Hale’iwa. Their request was approved in 1948. Hale’iwa literally means “house [of the] frigate bird,” but the name also has a poetic meaning, “beautiful home.” Frigate birds in flight are a symbol of beauty as they glide high above the ocean. 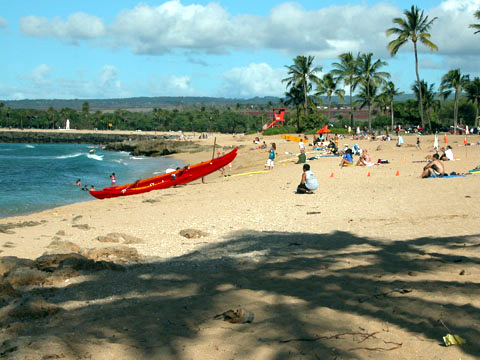 Hale’iwa Beach Park is fronted by a narrow sand beach. While its shallow, rocky ocean bottom does not attract many swimmers, the park is well-used by canoe paddlers as a training and regatta site, by kayakers as an access point to the bay, and by surfers who ride the waves at Pua’ena Point. This description is from John R. K. Clark's Beaches Series: Beaches of Oʻahu, Beaches of Kauaʻi and Niʻihau, Beaches of Maui County, and Beaches of the Big Island published and available for purchase from the University of Hawaiʻi Press. We thank John R. K. Clark for providing beach descriptions for use on this site. No beaches are currently closed.